Sun. 8th August: Midland Women’s League: We’re Up! 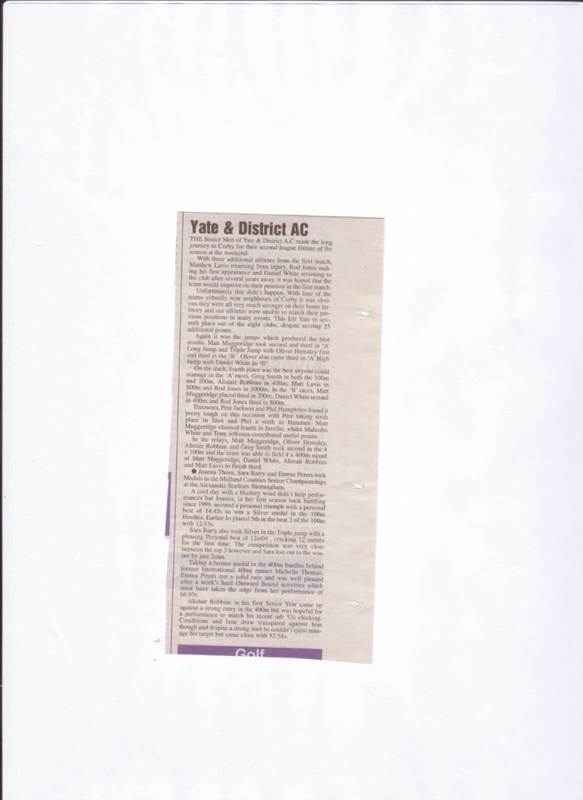 Yate AC went into the third match (and final one: not really enough) of this season’s campaign in second place, with only Nuneaton having a reasonable chance of catching us. The scores varied wildly in the earlier part of the match, and Yate were actually league leaders at one point, but start-of-the-day leaders Halesowen eventually took the match lead and held on (final scores: Halesowen 225½, Yate 220½, Wolves & Bilston 216, Dudley & Stourbridge 200, Nuneaton 172½ and Bristol 171½. So Halesowen and Yate go up, Dudley and Bristol go down. 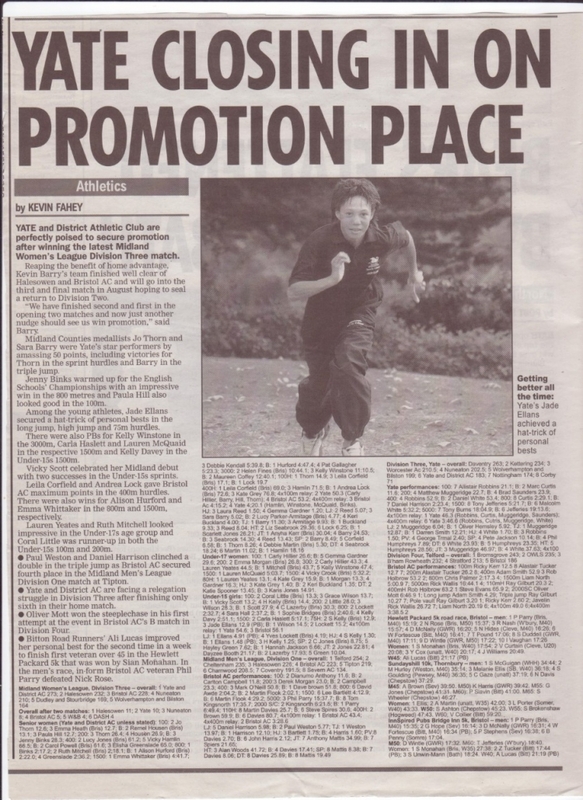 Notable individual performances included: a club Under-13’s record 12.8 for Vicky Scott; doubles from Paula Hill and Carly Hillier on 100m and Carla Haslett and (can’t read my notes) in the under-15’s 1500m; “A” wins by Jenny Binks (1500m) and the Senior 4x100m Relay team, and “B” wins by Vicky Hamblin (100m Hurdles), Kerri Buckland (U17 80m Hurdles) and Karis Jones (300m). So congratulation to the team and to Team Manager Kevin Barry, and good luck in 2005. In sixth place going into the final match at Nuneaton, and finishing sixth, we ought to have been OK. But seventh-placed Corby, last in two of their fixtures, were somehow inspired to win the match, thus sending Yate down to Division Four, along with Wolves and Bilston, seven-times British League winners in the sixties and seventies. There were some good features: a club Senior Men’s record for Dan White in his High Jump win; a 100/200 double by Ryan Scott; three Jumps B wins for Olly Hemsley, and a sprint relay win. The less good feature: only three points out of a maximum 32 on the hurdles events. Volunteers for next season please! Sun. 1st August: National Young Athletes League: We’re Up!!! Two points of note: the jump of 5.15m from Jade Ellans in the Under-15 Long Jump breaks a ten-year-old club record, and a special set of people gained maximum points in all five matches: The Officials!. The final match of the 2004 season was held at the pleasant, tree-lined track at Leamington. The Women’s team finished second on the day, so despite the fixture clash in round two they finished second to Cardiff. The Men’s match was won by previously low-scoring Swansea, which pushed Yate back to sixth for the season. Event winners were Ryan Scott (100m/200m), Jenny Binks (3000m), Carly Hillier (B 100m and B 200m) and the Women’s Sprint Relay team. Final score: Yate 302, Plymouth 290, Yeovil 240, Swansea 194, Bromsgrove & Redditch 186. And another Athlete of the Match award: this time for Harry Webb (Under-15 400m). For the second year in a row, Plymouth lost out because they failed to supply enough Track officials. Congratulations to Ryan Scott, who won the Senior Boys 100m at this year’s English Schools Championships at Gateshead. Ryan won his heat, semi-final and final in 10.64, 10.75 and 10.75 again. Harry Webb finished 7th in the Junior Boys 800m (taking the club record in the process); Paula Hill was 7th in the Inter Girls 200m final (not far off the record). 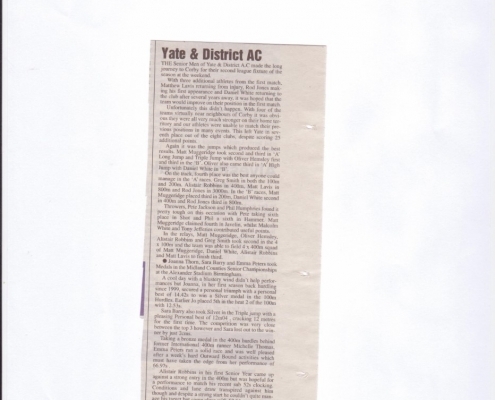 Other Yate athletes were there: results awaited. We had good scoring from all three age groups, and few empty lanes. In the Seniors, we had wins from Paula Hill (B 100m), Jenny Binks (800m), Jo Thorm (100m Hurdles and B Shot), Sara Barry and Keri Buckland (Triple Jump), Scarlett Jones (B Hammer) and Vick Hamblin (B Discus); Under-17 wins came from Carly Hillier (100m) and Lauren McQuaid (1500m); Under-15 victories from Jade Ellans (High Jump and Long Jump), Victoria Scott (B 100m and 200m), Grace Wilson (B Hurdles) and Hannah Jackson (B Shot), and the Relay team. So on to Brierley Hill (Dudley’s home ground): we know already we will have some athletes on holiday, but other athletes’ families take holidays too. Filling of lanes could win the vital points! Sun. June 27th: Three Athletes Of The Match? In Round Three of this year’s National Young Athletes League (at Hereford) the club won the match (Yate 373, Stratford 324, Hereford 198), and took Athlete of the Match in three of the four categories (Luke Nicholls U15B 200m, Victoria Scott U13G 75m, Jade Ellans U15G Long Jump). Victoria Scott also took two more club records (75m and 150m). Thanks to all who competed, including “solo performers” Brad Saunders (400m Hurdles), Gemma Gardiner (300m Hurdles) and John Collier (Steeplechase). Meanwhile Emma Peters was in Bedford taking a Bronze medal in the AAA Under-23 400m Hurdles Championships. Congratulations, Emma! Today’s National Junior League match at Yate was actually hosted by Bristol AC. Congratulations to Liz Seabrook, awarded the Woman of the Match award for her Hammer win (in her first season at the event too). The Women’s team won, with the Men’s team fourth: individual winners included Jenny Binks (800m), Kate Grey and Kerri Buckland (High Jump), Kerri again (Triple Jump), Katie Spooner (B Shot Putt) and Liz Seabrook (Pole Vault and B Discus as well as that Hammer); Ryan Scott (100m and 200m), Daniel Harrison (B 100m), Sam Dalgleish (1500m), Darren Smith (Triple Jump) and the Men’s sprint relay team. … Little Sister can do too. Ryan Scott had taken the club Under-20’s 100m record a fortnight before, and beat the 200m record the previous day (Avon Schools Championships, 21.6) and again at today’s Avon League meeting (21.5). 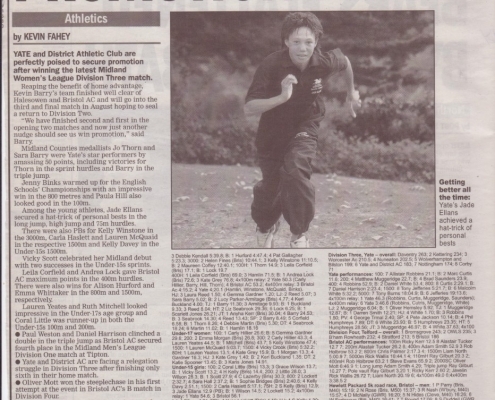 Victoria Scott matched this by taking the Under-13’s 100m record (with 13.4) and the 200m record (with 27.6) which had remained intact since 1992. Congratulations to both! In the overall match totals Yate finished second behind Bristol. In Round 2 of this year’s National Young Athletes League (held at Yate again: there seem to be fewer and fewer venues able / willing to stage meeting of this League), Yate led for the first half of the meeting, but never by much, and the margin gradually drifted away. Final scores: Wolverhampton & Bilston 361, Yate 349, Cwmbran 234, Newport 188. Yate athletes gained five medals at this weekend’s Midland U15/U17/U20 Championships at Birmingham’s Alexander Stadium. Ryan Scott’s silver medal winning time of 10.79 for 100m is the fastest time recorded by any club member (if you consider, as most statisticians do, that an electronic 10.79 is superior to a hand-timed 10.7). Jenny Binks took silver on U20 3000m (another club record) and Harry Webb gained the same on U15 800m. Scarlett Jones (U17 Hammer) and Sam Dalgleish (U17 1500m) took Bronzes; Tom Carpenter, Joe Dalgleish, Paula Hill and Ashley Jones also reached finals. (Note: after the results were checked, we were lowered to third place, as a couple of our athletes had not been registered with the MCAA in time). On the same day the National Junior League teams were at Cheltenham. In the Men’s match, Ryan Scott took the Man of the Match award with his wins on 100m (10.8) and 200m (22.0). Team scores: Cheltenham 307; Leamington 240; Bristol 208; Cardiff 193; Yate 156; Swansea 142. Once again the Women’s League fail to worry about a clash of dates with the National Junior League. Our Women’s team at Cheltenham was otherwise known as Katie Spooner, whose throws would have guaranteed us two League points. (Men’s result not yet to hand). An enjoyable day of athletics; results-wise, another mixture of triumphs, dispappointments and “why didn’t we get so-and-so to enter that event?”. The Men’s team opened their season at Worcester, finishing sixth (Kettering 257, Daventry 226, Worcester 224½, Notts 220, Nuneaton 185, Yate 152½, Wolves & Bilston 122, Corby 121. Sunday’s National Young Athletes League resulted in a win for the hosts (revised scores: Yate 359, Exeter 317, Dudley & Stourbridge 253, Kidderminster & Stourport 171). A good weekend for athletics but not for computers: the programs in use at each meeting for result calculation (both League-supplied) fouled up. Our National Junior League campaign opened with one of the club’s many home matches this season. The Men finished sixth (Cheltenham 265, Cardiff 219, Bristol 212, Leamington 186, Swansea 165, Yate 106, Stratford 98) and the Women’s team second (Cardiff 222, Yate 153, Swansea 128, Leamingtom 125, Cheltenham 88). Jenny Binks is now an Under-20, and took an early chance to attack the records list, breaking the 1500m and 3000m records in her two race wins. Paula Hill won the 200m, Kelly Winstone the B 1500m and Scarlett Jones the B Shot Putt. In her first competitive attempt at the event, Kerri Buckland took the lead in the Triple Jump but injured herself in the process: that jump, though, was enough for the win. The next fixture (May 23rd) clashes, as seems to happen at least once a season, with a Midland Women’s League match. The Avon AA again held a Young Athletes Multi-Events Championships this year, reasonably well attended by younger Yate AC and Bristol athletes (but none from any other clubs or schools). Jade Ellans won the Under-15 Girls title with Rachael Spooner fourth and Charlotte Willey fifth; Jason Stockwell took second, Brett Halliwell third and George Hart fourth in the Under-13 Boys Quadrathlon; Emily Kingscott’s work on Cross-Country over the winter showed as she pulled up to second on the final event (800m) in the Under-13 Girls Quadrathlon; Bethany Jones was 5th, Emma Journeaux 6th and Katie-May Elliott 7th. Just one Under-15 Boy competed though (not ours), two Under-17 Women (neither ours) and no Under-17 Men at all! Sun. April 4th: How Should We Start The Summer Section?Would news of a set of National Gold Medals be okay? The Westbury Under-15 Boys took the Gold medals at the National Young Athletes Road Relays, held at the usual Stuuon Park venue. Tom Carpenter led off, coming home in ninth place; Richard Peters, in his club debut, ran with the pace judgement of a veteran to take the team through to third; Sam Dalgleish snapped up the last two opponents and held his position through to the finish. Congratulations to the three of them! Elsewhere in the meeting: Another Westbury team (this time the Under-15 Boys B team of Harry Webb, Damien Holcombe and Robert Mullett) fell victim to a changeover official’s slip-up but they still finished 24th (and second B team); the Under-17 Women (Kelly Winstone, Lauren McQuaid, Marie Drucker-Allister)were 12th, and the Under-13 Girls teams were 29th and 71st.